Springbok & Sharks flyhalf Butch has always had a reputation for putting the shoulder in on players, normally resulting in trouble for being too high or with not arms. A few years back he was infamous for it. He had a reputation for being a dirty player and refs started to pick on him because of his past indiscretions. An advert even came out on local tv about it, showing him giving blood, with him saying "Use your arms". Those bad rep days seem to be over though. He's found form with the Sharks, and is almost a certain choice for the World Cup squad. His tackling has also come right, with him still being a physical player, but keeping on the right side of the law, as seen below with this fantastic hit on Stirling Mortlock in the 2006 Tri Nations. He got it spot on. Great camera work too. 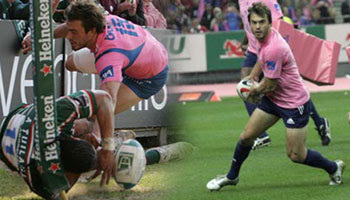 Juan Martin Hernandez of Stade Francais makes this brilliant try saving tackle on 113kg Leicester winger Alesana Tuilagi in the 2006 Heinekein Cup Quarter Final. 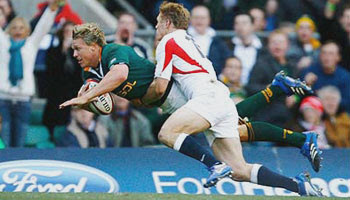 Similar hit to the Josh Lewsey classic try saver on Jean De Villiers. The scariest part about all of this is that when searching for pics of Hernandez to post on here all I came across were half naked men covered in very, very small towels. Golden Boy Daniel Carter gets smashed by the Hurricanes flanker Chris Masoe. Masoe's brother is a Heavyweight boxer, enough said. The ref decides it's offide, but is it REALLY? Close call. 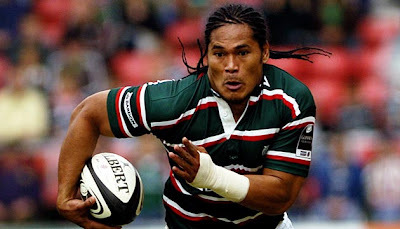 This is a nice hit by the big Leicester Tigers & Samoan winger Alesana "Alex" Tuilagi against Stade Francais. There's something about the pink jerseys that makes the tackle all the more enjoyable for some reason, although Stephane Glas would probably disagree, as he was the recipient of the big hit. Not the biggest or hardest hit, but great pressure on defence which forced the turnover. 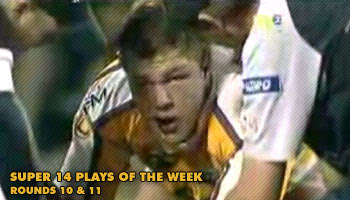 Super 14 Plays Of the Fortnight rolls around once again. 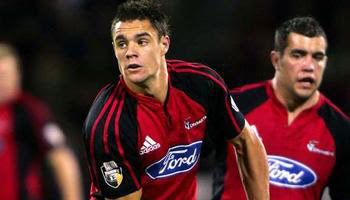 Noticeable items would be the incredible banana kick conversion by Dan Carter. A bit of reverse swing in a rugby match is a first. Was he shining the one side of the ball before taking the kick? Ali Williams with ball in hand effected a massive hit on Dwayne Vermeulen, which resulted in the pic above. Lights out buddy. Jason Robinson brought down the curtain on his club career with a fairytale last-minute try to beat Bath 25-23. What a way to end his club career. One of the best finishers in the game waiting until the clock was dead to write his own script and go out in style, showing the kind of vintage Robinson class and explosiveness that made him one of the most feared runners in the game. Update: Clip has been edited and shortened, so doesn't show the other highlights any more, just features the Robinson winner and interview. Waisale Serevi displayed some sublime skill at the recent Hong Kong Sevens tournament. He's been doing it for years, and continues to impress. With seconds left on the clock, the 38-year-old Serevi shows why he is rated as the best player in Sevens history by running circles around the younger Kiwis. Putting his teammates into gaps, he then receives the ball again and scores the winning try. Tomasi Cama junior can't take it and dives on him very late. He gets a few pats on the head for his troubles. Funny, cos his father (Tomasi Cama senior) would have played with Serevi. Bit of history there, as you can tell by the way the Fijians act towards the young 7's All Black. This occured between the All Blacks & England in 2004, and is more of a talking point than a spectacularly violent incident. Simon Shaw gets red-carded in the 10th minute for kneeing All Black lock Keith Robinson during ruck-time. England, who had had a decent start to the test match, had to play with only 14 men for the rest of the match. They lost 36-12. Clive Woodward, the English coach, was furious about the sending-off: "We had an incident in Wellington last year when Ali Williams (All Black lock) stomped all over Josh Lewsey's head and was cited, but got off scot free in front of the judiciary." All Black's Coach, Graham Henry, had no comment. The New Zealand Captain, Tana Umaga claimed that a 15 vs. 15 game would have been better, as the sending-off greatly altered the composure of the two sides. 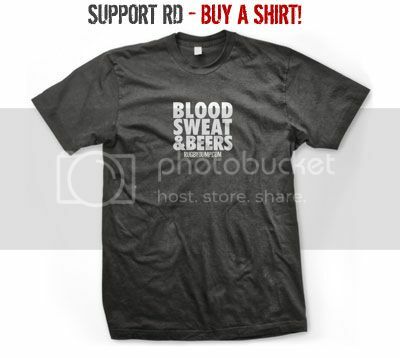 "I was on the bottom of a ruck and I heard the crowd go off. I didn't know what had happened. When I got up I saw the red card, but I can say he didn't hurt me in any way. They are a physical forward pack, but I don't think they were trying to target anyone in particular." Check out Tana Umagas face when he sees that Shaw has been red carded. After many requests, here it is. ANOTHER brilliant try from a front rower. Who says fat boys can't move? Phil Kearns' comment says it all - "Front rowers are not allowed to run more than 3 meters for a try - it's in the bylaws". 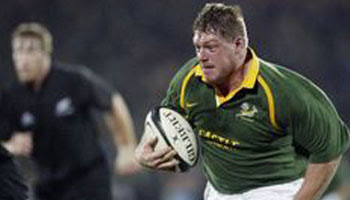 Dunedin 2003, Springbok prop Richard Bands scores this memorable try against the All Blacks in the Tri Nations. Running at full tilt and bashing over Carlos Spencer on the way to the line, Bands scored one of the all time classic prop tries. Front rowers around the world would be proud. Hell, any backline player would also be chuffed with scoring a try like this. 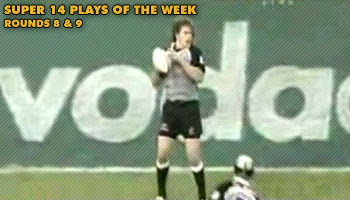 Weeks 8 and 9 of Plays of the Week were compiled into one action packed episode. Some brilliant moments, including Doug 'The Hitman' Howlett showing once again that wingers can use their speed and strength to make an impact on defense, not only attack. Plenty of 'Percys', including Francois Steyn with a few classics. Eyes on the ball plz Francois. Peter Hewats 'Phantom Percy' was the best in my opinion though, with the commentators "Naaaooo naaaooo naaaooo!" saying it all. I also loved Jerry Collins' comment to the 'Rif' about whos REALLY reffing the match. Classic. 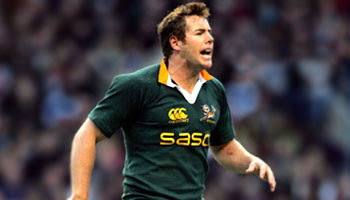 In the first test against England in Nov 2006, The Springboks' Jean De Villiers got yet another trademark intercept, but he unfortunately wasn't able to capitalise on it. 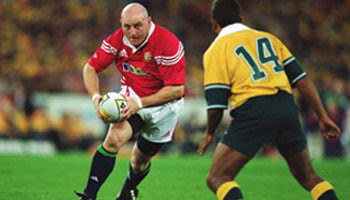 Instead of finishing the try by stepping inside or flicking the ball to Ndungane, he decided to back himself, but was shown up excellently by the covering Josh Lewsey. Brilliant try saving tackle, but to be honest, I think Lewsey would have been shocked De Villiers stuffed it up so badly. Bad mistake. Great result for the English. Postponed coach Andy Robinson getting fired, for a week or so anyway. Here's a great moment from the 2003 World Cup when King Carlos Spencer flicked the ball through his legs to create a try for Joe Rokocoko against the Springboks. Looks simple, but that's because of the quality of the player. Most guys wouldn't be brave enough to try that in a match, and if they did and they failed, they'd be shot. Not Carlos. Excuse the rehashed video quality. Keith Wood has a dirty little secret. In a tour match against the Aussies, playing for the British & Irish Lions, he shoves a TV cameraman on his way off the field. There is absolutely no explanation for this at first glance. Anyone have any clues as to what brought this on? Update: Upon closer scrutiny and investigation, it seems as though a a TV cable and some foul play are what provoked the little push. With less than 15 minutes left on the clock and the score tied at 13-13, Juan Leguizamon shows the world that there's always one vital thing to remember when diving outrageously over the try line - don't forget to hang on to the ball. He was apparently trying to mock a fellow premiership player, but this went horribly wrong. Remember the Amateur Hour try on here? That has nothing on this complete balls up. 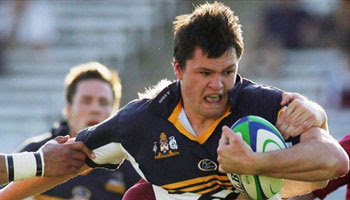 Great speed shown by the Brumbies fullback here against the Cheetahs. I think they were all shocked that he kept going, and by his frame, he doesn't look that quick! 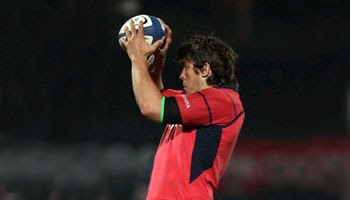 Fantastic try though, and good to see him back himself. 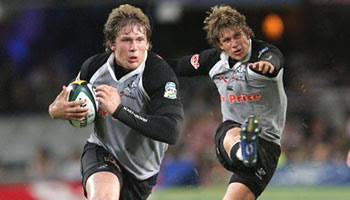 Young Sharks & Bok sensation Francois Steyn is fast getting a reputation for being a hard runner and one of the best drop kickers of a rugby ball around. 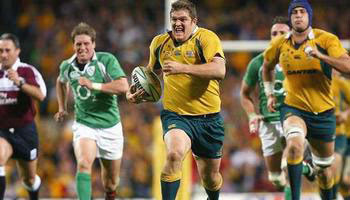 He proved that again on friday, where he pumped a 53 meter kick over with ease against the Force. Great reactions from the commentators. He did the same against the Blues, so I've edited this post to include both monster kicks. 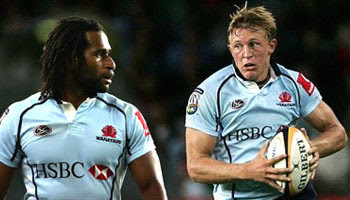 The Waratahs played in a thriller against the Crusaders on the weekend. If it weren't for some poor play by Peter Hewat (missing a vital conversion and dropping the ball in open play, as well as him & Lote stuffing up an intercept) the Waratahs may have snuck victory. The 19 year old Lachlan Turner arrived though, scoring a fantastic try in which he outstripped Rico Gear and beat Leon McDonald. Huge potential shown, and a possible find for the Aussies for this years World Cup? Still early days though. Besides Lote Tuqiri's shocking intercept try attempt, he redeemed himself here with an excellent run and set up a try, showing the skills & strength expected of him, and expected of a guy who gets paid that much.